This hymn is the favorite sister of Hymn #2, "The Spirit of God." They compliment each other so well. Both were sung at the Kirtland Temple dedication and even to the same tune, HOSANNA (neither of which is the tune we know today). While "The Spirit of God" describes the ushering in of the final dispensation leading to the Millenium, "Now Let Us Rejoice" comes back down to earth. To my ear, it's more of a hardy Barn Dance than a traditional hymn. But a Barn Dance that definitely belongs in our hymnal. I can just imagine the early church members gathering with fiddles and drums and have a grand old time swingin' their partner round and stompin' their boots to the tune. It has that robust, in 3, dance-feel to it. But the circumstances of the writing of this text was anything but joyful and worthy of a Barn Dance. Phelps made his living as the editor of the local newspaper. While living in Jackson County, Missouri with his family and about 1,200 other early church members, William Phelps experienced terrible persecution. Here's the story as told by George D. Pyper in his book "Stories of Latter-day Saint Hymns." "Presently, in 1833, a mob, plentifully armed and numbering between four and five hundred, came upon the settlement at Independence. They tore down the two-story brick building in which the press was housed and in the lower part of which the Phelps [family] lived; they destroyed the press, burned the books and papers, drove Mrs. Phels and her baby out upon the street; . . . and they served warning on all the Saints living in the county not to do any more work or build or buy or sell in their settlements. Later, when the chill of November came, all the Saints were ejected from the county, and were not allowed to take with them any clothing or food. And later, more than two hundred houses in which they had lived were destroyed.
" 'Now Let Us Rejoice' came out of this situation. Defeat, frustration, homelessness, suffering, privation, hunger, even--these produced a hymn that still gives hope and sustenance to hundreds of thousands who live in better times. . . . It was the lily coming out of the ooze." But what a story. And to 'Rejoice' during these awful and terrible times. It reminds me of a verse in Hebrews when Paul, talking of Jesus and why he went through such torture and pain said..."who for the joy that was set before him endured the cross" (Hebrews 12:2). For the joy. Jesus, for the joy of gaining the strength and power to heal us by means of his suffering and perfect atoning sacrifice. The early members of the Church, for the joy of having the restored Gospel and building the kingdom of God on the earth, never to be taken away again. Now, about the music. Doesn't this history give it some new meaning? It does for me. But let's examine deeper. What is it about these little black dots that makes me want to get up and romp when I sing this hymn? There are some fantastic Baroque Dance elements in this hymn. I'm a total Baroque music nut! Thank you, Dr. Robert Tueller, BYU-Idaho music professor, for infecting me with Hyper-Baroque-itis! The Baroque folks were the real "Dancing Queens!" These guys and gals knew how to have fun. This is when people actually left their home to visit their friends and have actual interaction with other humans instead of texting or tagging them on their smartphone. And when spirits were high, they danced! 'Now Let Us Rejoice' has that clodhopping downbeat with a crisp rhythmed pickup, the dotted eighth-sixteenth. Then it's off to twirling around in a quick triple meter. Proper dance music is almost always in 3, at least the fast dances are. Like a Baroque 'Gigue' (jig), the bass line is very plain and holds onto the same notes for much of the piece. The resulting harmony is also very plain, only the Tonic (the 1 chord) and the Dominant (the 5 chord) with a little Sub-Dominant coloring here and there (the 4 chord). You may recognize that chord progression. It's responsible for thousands upon thousands of songs, from Bach to the Beatles and Beyonce. The tune is also quite simple, but one little trick keeps it going round and round and intoxicating my inner barn dancer. It's another Baroque device. It's a sequence. A musical sequence is a series of notes that repeats itself but either one note higher each time, or one note lower each time. "No longer as strangers on earth need we roam" is an excellent descending sequence. A-A-G, then repeats, G-G-F#, and one more time, but the 3rd time is usually different somehow, F#-F#-E-E-E. In this case, the 3rd time is just a little longer, and it ends the 1st half of the phrase. But we pick right back up with our clodhopping downbeat proceeded with the crisp dotted eighth-sixteenth letting our skirts fly again. To end the 2nd half of the phrase, the clodhopper returns and we get two dotted eighth-sixteenth figures in a row as the melody steps right up the scale to Do. Wonderful dance music! The 2nd half of the hymn is almost identical to the first half. The only difference is the 1st 4 bars of the 2nd half. "When all that was promised the Saints will be given." Typically you'd expect the melody to now take off into some other realm. But instead, the hymn gets even earthier. There's no swaying those Mormons once they get a goin' in them their line dancin' reals. 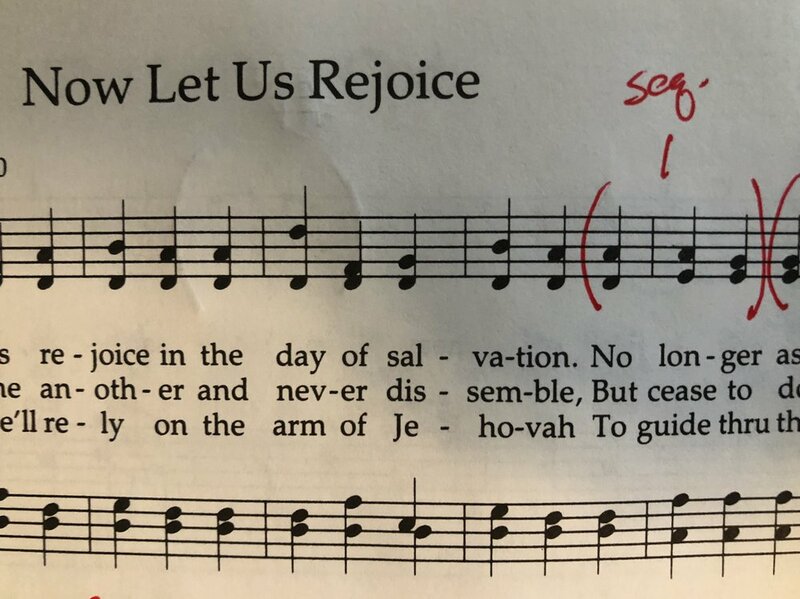 What's great about this little 4-bar section is the 1 little rhythm that ads a TON of personality and difference to the whole hymn. It's the little gem of the piece for me. No, not the G#, though, that is fun, especially with the accompanying E# in the tenor line. But that's just a little note-smash, a little barn-dance-flurry or coat-tails. The bit I love is the dotted-quarter eighth-note figure. I don't think we emphasize this enough in our hymn singing. To make it really pop, you have to put the final "D" of the word "promised" right on beat 3 and bounce right off of it to the eighth-note. I always make a big deal out of this spot when I'm at the organ. It's amazing what one little rhythm can do, especially when it stands out as the only one of its kind in the piece. Then we're right back into the same music we heard before, starting with the delicious descending sequence again. And the hymn zips along precisely as it did before with those same double clodhopper rhythms leading us back up the scale to a final "Come home" on Do. Rather appropriate I'd say. Great stuff. It belongs in our hymnal. 100%. No question. So, ta ta for now. More tomorrow. And did you know that the composer of tomorrow's hymn, #4, was great friends with one of the most loathed composers of all time? P.S. If you haven't signed up yet for regular notifications of these posts, click the button below and enter your info. I'll be posting on Facebook and other platforms every day as well. Another hymn that makes it into my all-time favorite hymns. Another example of why I hold William W. Phelps in such high regard, and the tune again is a perfect vehicle for the congregation to unite in rejoicing. I would likewise register this hymn as I do the first two (a recurring theme or pattern is beginning to emerge with these powerful, triumphant hymns!). If you are comfortable with reharmonization, this hymn is a great candidate for it as well, as the harmonic interest of the hymn as written is rather basic. 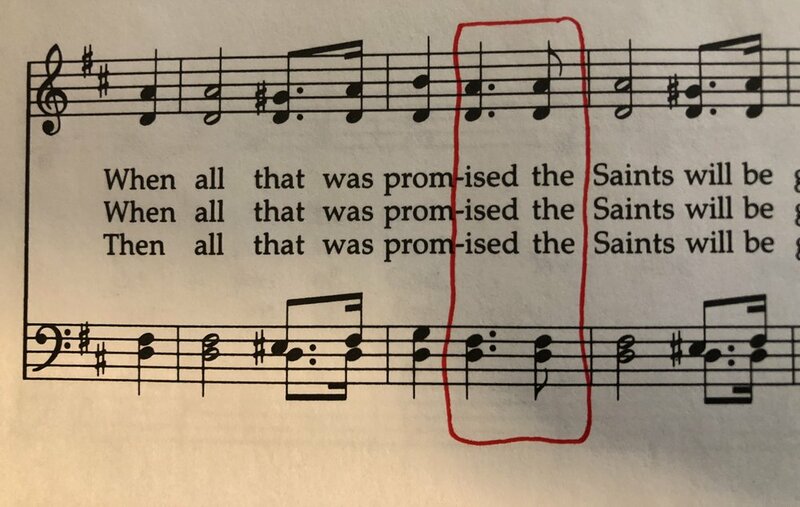 As I am able to see Doug’s musings on this hymn before crafting my own, I will differ from his opinion on how to treat the dotted quarter-eighth note figure at “When all that was promised the Saints will be given.” I think that putting in an eighth-note rest is extremely disruptive to the text, splitting it in two. Treating it in such a manner renders the text “When all that was promised! The Saints will be given and none will molest them from morn until ev’n.” I always try to play it in a manner that the D on promised is able to be elided with “the Saints” to keep it one phrase. I will agree with Doug and strongly advocate for a crisp, rhythmic treatment of all dotted rhythms. These are not meant to be triplets and it significantly weakens the hymn if they turn out as such. Crisp, rhythmic dotted notes preserve the dance! I also again think the tempo indications are a bit slow. This hymn to me definitely wants to be in 1 (it does recommend Cheerfully!) and I feel that can’t be achieved playing slower than 120. I probably play this somewhere around 124-128 in a normal Sacrament Meeting. Of course as I play now to check, this brings me comment that I use a judicious use of rubato so that there is room to breath between phrases without adding in beats. I do allow for room between phrases to breathe and get into and out of phrases with slight rubato in order to facilitate a more robust tempo. These are instances where I find it very important to practice before hand and sing the hymns yourself to see how they want to be done. I would recommend highly listening to Clay Christiansen’s arrangement of this hymn. It is on the CD Now Let Us Rejoice on the Mormon Tabernacle Choir label. I couldn’t recommend the entire disc more highly as great examples of hymn treatments worthy of preludes and postludes for LDS services, and Clay’s arrangement to me absolutely fits the affect of this hymn.